With Safari 4’s improved history search, Top Sites and controversial tabbed windows features garnering much of the attention, users have largely overlooked support for HTML 5 introduced in the public beta of the next version of Apple’s Web browser. HTML 5 is the latest Hypertext Markup Language—the core language for the Internet. Web developers use this programming language to build the Web sites that we visit every day. HTML 5 offers support for audio and video tags, giving developers an easier way to bring them into Web sites. Apple promises support for HTML 5 media tags among other next-generation Web standards in Safari 4. An example of Apple’s implementation of HTML 5 is closer than you think. Apple posted a page on its Web site showing how HTML 5 will change what we can do on the Web and how it will look in Safari. 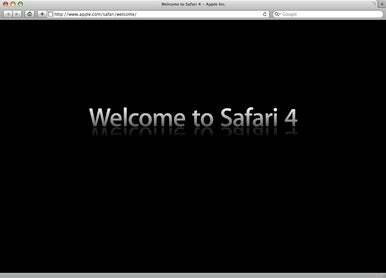 If you point Safari 4 to Apple’s welcome page, you will see all kinds of things going on. For instance, there’s an animated Safari icon, audio and video, all put together using HTML 5 and all generated dynamically. Apple also used CSS 3—the Cascading Style Sheets used by Web developers for Web site presentation—to add reflections and gradients to the page. Items like the reflection are generated dynamically and HTML 5 video and audio tags bring the whole presentation together. Safari isn’t the only Web browser that will support HTML 5. Firefox also announced plans to support the technology in future releases.